Every year I like to make a little holiday themed mosaic. This year though, finishing up some other projects meant there wasn’t a whole lot of time to invest. 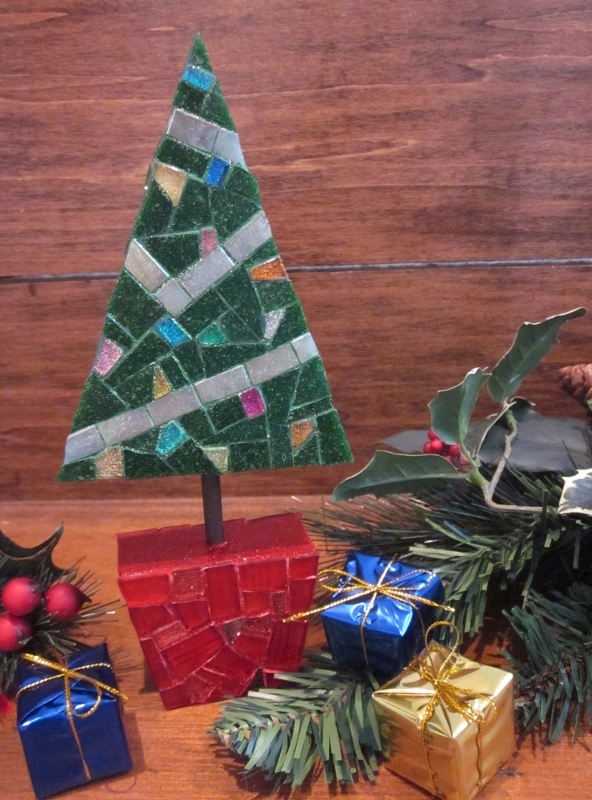 Then I found this wooden gem of a tree to mosaic while in a local craft store. Perfect! So here is this year’s little offering of holiday cheer, just simple, small, glittery and cute! My wish for all of you – a very happy holiday season, for whichever holiday you celebrate! Plus, a new year full of beauty and love! The 3-D Birch Trees at Night is all finished! The 3-D effect of the trees in person gives a nice extra bit of something to this piece. Since they sit higher than the background, they also reflect a bit sometimes in the dark grey mirror background which gives even more dimension. Ordered a special frame for this one – the place I normally order from and I got mixed up on the depth. They made a frame for me deeper than they usually do – but this made for a happy mis-hap as it allowed me to place the piece in it and have the birch that pokes out the most fit perfectly flush with the front of the frame. Initially I’d wanted it to go beyond – but this works better. I guess sometimes the universe gives us accidents on purpose when it knows better than we do! So I stuck with what I said in an earlier blog posting and did actually make a little series of 3 out of the Birch Trees at Night idea. For the 3rd one though, I wanted to make it just a little different. Still run on the same theme, use the same colors – but make it a little different somehow. The somehow different came in the form of adding a bit of 3-D. I love 3-D mosaic stuff. I’ve done a little bit in the past, but not a lot. A trip to the local hardware store for some various bits of wood – a few cuts with the mitre saw ( which I adore using and want to find every excuse in the world to cut something with it!!! <–my Dad would have been so proud of that statement 🙂 ) and I had some bits that I could glue to my wedi board and make it so my trees weren’t all just flat on the same surface. The indecisive Libra in me took quite a long time playing with different layout ideas, but in the end settled on a set of 5 trees in 3 different widths and also 3 different heights. Here’s just a few “in-progress” pics, next week I’ll show you the final outcome! The longer Birch Trees at Night is finally complete! Some pics of the completed piece and a few details shots are posted below – hope you like how it turned out! All the white birch tessera are on the Wedi board! Next step will be to start in on the background. It is this neat kind of gunmetal mirror with a bit of a wave in it, nothing crazy wavy, just a suttle bit. Also in the background is a bit of this dark translucent purple. You don’t see it as “purple” once it is surrounded by the gunmetal mirror and embedded in the black thinset – it just becomes a dark space in the background, not solid black but not purple, just dark space. For the mirror though, this time, I decided I should try sealing it. Haven’t ever bothered to do this step before and have never had any problems with mirror use – but I’d read there is potential that not sealing cut mirror edges can lead to a breakdown of the backing / reflective part of the mirror. 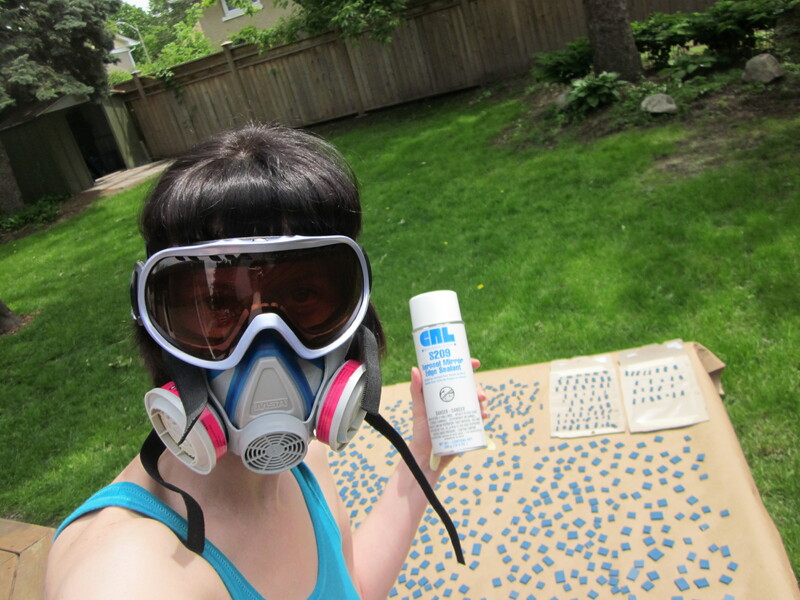 So – I cut out a bunch of bits, laid them all out on a table – donned my handy respirator mask because I was at the time having allergy issues I didn’t want to exacerbate – and went to town with the sealant spray! Think perhaps I should make this picture below my profile picture on all my social network sites – what do you think? 😉 Next week – I’ll show you how the background and finished mosaic look! Getting ready to attack about 1 million little mirror pieces with sealant spray! Fun Birch factoids you can share at parties! Progress has been made on the latest in the Birch Trees at Night series (<– see, use of the word “series” I’m trying to lock myself in to doing more of them…. 🙂 ). The first bits of white are going on well! There’s about 100 different species of birch trees and they’re confined to the Northern Hemisphere. After the last Ice Age, they were some of the first type of plants to grow, in botanical terms they’re known as a pioneer species. Very hardy, highly adaptive and able to thrive in difficult areas. These traits make it a prime subject for symbolism in various cultures in terms of representing rebirth and renewal or hardiness – in Celtic mythology the birch is a symbol of just that, renewal and purification. The Celts also used the Birch to protect against evil. 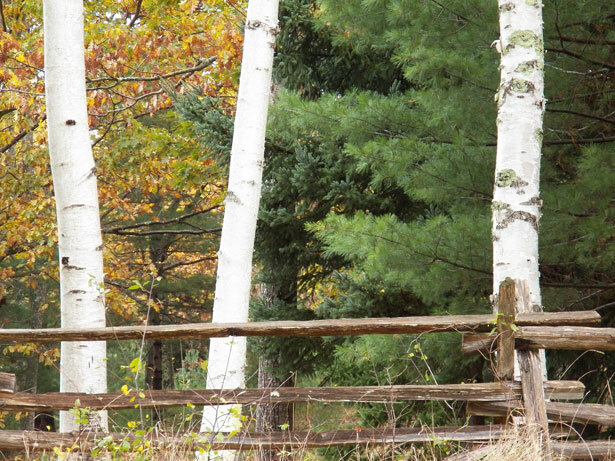 In Chinese symbolism the Birch is also held as a symbol of rejuvenation and protection as well as communication. This city of Umea in Sweden is sometimes known as the “City of Birches”. In 1888 a fire devastated the city and a popular legend says that it was a silver birch tree that stopped the fire before it completely destroyed the city. During the restoration – the city planted silver birch all along wide avenues to prevent future fires from spreading. People in ancient Europe also revered the birch and would bring twigs inside their home as a physical intention of invoking protection. Finally – a little extra fun factoid – you should buy a broom with Birch branches at the end, as these brooms are thought to “sweep away” negative energy! Earlier this year, I made a little 8” x 8” project called Birch Trees at Night. Initially I just meant for it to be a quick little project that would put to use some dark grey wavy mirror that didn’t work out on another piece. I’d thought that little 8 x8 would look nice, but in the end it looked way better than I’d envisioned. In person it really has a “wow” factor to it and I fell in love. So – I’ve decided to do a little series of different sizes and shapes but on the same theme. The next project in the hopper may look familiar but will be a little different – a nice long version of the birch trees. It will be 8” x 36”, I’ve modified the pattern a bit and transferred it to the Wedi board. The same 4 shades of white + the dark grey wavy mirror + the dark translucent purple will be used again. It is a really interesting size and quite possible that this one has the potential to come out with even more “wow” factor. If you can’t tell, I’m kind of excited by this one :-), I’ve wanted to be working in much bigger formats for awhile now. This will be a bit of a foray into that larger sizing – though the 8” portion isn’t so big, the length is much longer than I’ve done before. 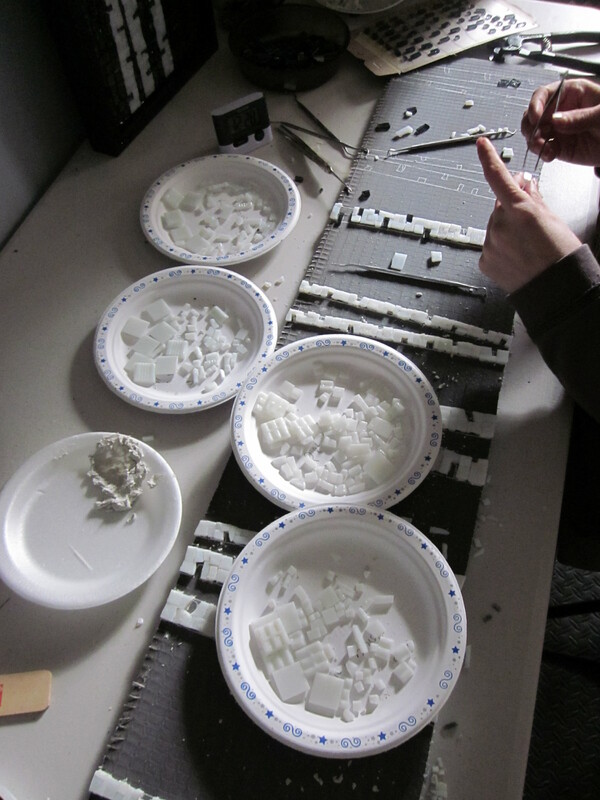 Next week’s blog will contain some of the initial in-progress pics so be sure to check back in! 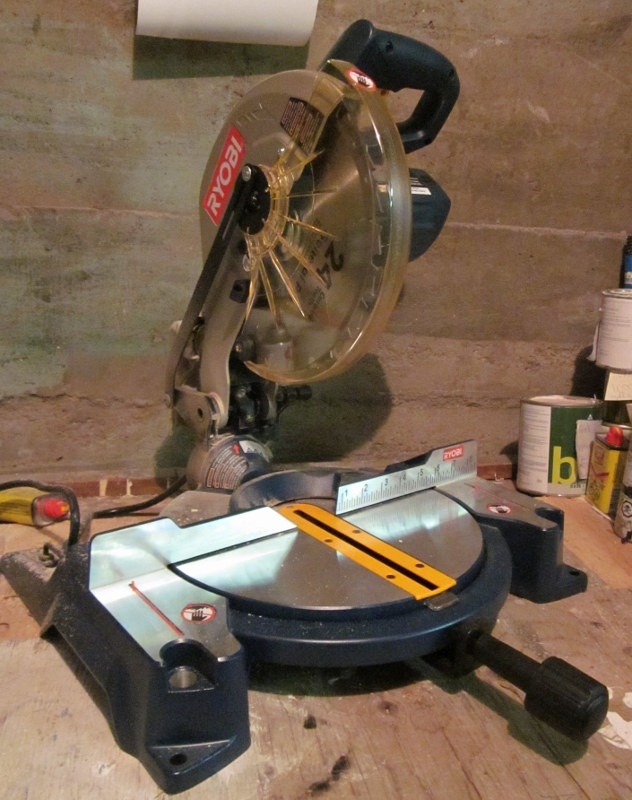 8″ x 36″ wedi, cut out and ready to mosaic! I have been obsessed with birch trees since coming to Canada. I know, I know, it should be the beloved Canadian Maple but as much as I adore the syrup it produces the Birch beats the Maple in my fascination. I love the bark on these trees, the variations in the white you might find, the shape of the trees and how they grow. Decided to do a quick little 8” x 8” project and use up some dark gunmetal grey wavy mirror that had been a part of some tests I was working on that hadn’t panned out. 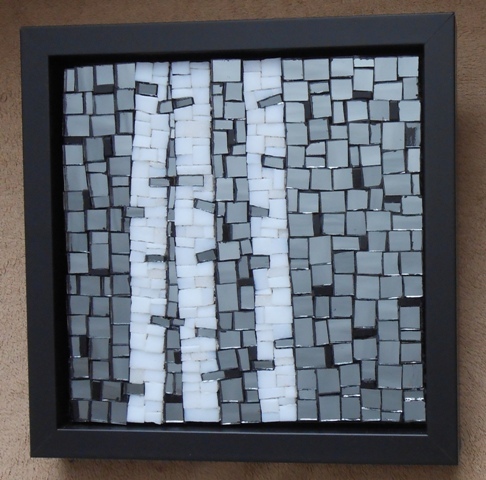 I poked around on the internet looking at pics of trees and such and decided on a simple set of birch done in several different whites with this dark grey background studded with a very dark purple every now and again. It came together quickly and I am so happy with the result. Am now going to expand on this idea – do a little series potentially, make a bigger one maybe in a different format, change the design a bit. Not totally sure yet, but you may see more on this theme in the future. For now though, here is the 8 x 8 for your viewing pleasure! Inspiration for this piece came from a mousepad of all places! The graphic was similar and I thought it would make a fun mosaic and make good use of a bit of the beautiful 24K Orsoni gold without being too flashy. 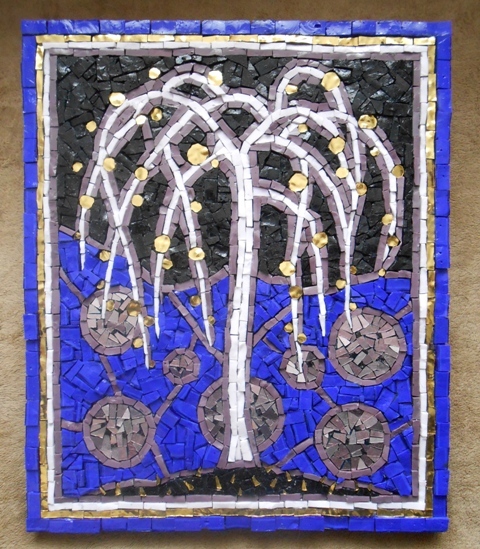 This mosaic was started off by creating the structure of the tree, then filling in the left over tight little areas. They made a joke at the workshop that I had the patience of a monk for all the tiny bits and filling in small spaces. 🙂 I’d thought this project would be faster and easier than the Lotus but it surprisingly was not. It turned out really fun, we’ve already ordered a neat thick black frame that will set it off nicely. It was made in the direct method on wood using Orsoni Smalti and gold in both the gold tone and gold lavender. Click an image below to bring up a larger picture review. Check back next week for a posting with the final projects from the workshop!